His capacity to grab attention with his illegally spray painted designs in major cities, and deliver a message (often a punch line or a hidden layer of meaning) may make him the most important artist of his generation. We recently traveled to Toronto, Canada to view The Art of Bansky, to discover the message behind the artist. 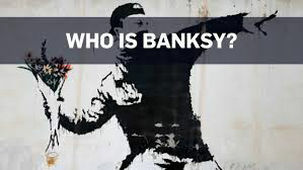 As far as we could determine, Bansky is the closest thing we have in the art world to Che Guevara. He didn’t so much knock on the closed doors of the art world, as he literally kicked them down. Banksy sees himself as the liberator to remind the viewer that their ideas about art are just as valid as anybody else’s. To his mind, art should be truly democratic, part of everybody’s life, not just the privileged few. As his former associate Steve Lazarides is quoted as saying, In my humble opinion, he helped normal people feel it was ok to like art. For the first time, they felt that they didn’t need a degree to ‘get it.’ In their minds, he created art just for them…He was owned by the general public, they took him to their hearts across the globe.